Looking for freelance jobs but don’t know which are real and legit to work online? Here is – “Top 5 Places to Look for Freelance Jobs“. Yes, you heard right. Today, I’m going to share top 5 places to find freelance jobs in this post. But before I head towards world’s best five websites for freelance job seekers, let me tell what is freelancing. Especially for those who are new to this term. Freelancing is the process of working online in which the one who works is self-employed and said to b a freelancer. He is free from any organisation and hence is said to be an “Independent Contractor” in other words. A freelancer is not committed to work for a particular employer for a long time. Freelancing covers a wide range of work including writing, editing, publishing, typing, web designing, proofreading, data entry, online advertising, internet marketing, software development and various projects of information and technology. There are various online portals present out there who offer you freelance jobs. But it is more important to go through their records, reviews and history before putting your hard work because there are many scams too. Sometimes people are trapped and get scammed but don’t worry here I have compiled a list of World’s Top 5 Freelance Portals so that you work for real and legit employer and don’t get scammed. Freelancer, earlier known as “Get a Freelancer” is one of the most trusted and popular place to get freelance jobs as well as hire freelance workers. According to the stats available on the website right now, 13,369,889+ professionals available on this website who have to complete over 6,541,159+ projects connecting over 247 countries and the counting is still increasing. You can quickly hire workers or find jobs full-time as well as part-time from a wide range of works like software development, writing, data entry, translation, and design right through to engineering, the sciences, sales and marketing, accounting and legal services. Odesk- “Hire freelancers and get hired”. The tagline itself says everything. It’s really a proud feeling to introduce a website which has been around us since 2003 and is still active. Odesk is also one of the most trusted and loving place for freelance workers where people can easily look for freelance jobs as well as hire, manage and pay the contractors. According to the stats shown on their website, there are over 5+ million registered freelancers, 1+ million registered clients and each year about 1.3+ million jobs are posted which are ever increasing with every second that passes. Odesk lets you work and choose workers mainly from a freelance jobs categories like web designing and website development, logo design, translators, data entry workers, mobile app development, article writing, SEO specialists, etc. Elance is a marketplace where you can find talented workers for your various projects. You can quickly hire freelancers for your projects as well as find works for yourself based on your skills. As the website statistics show, about 117,490+ jobs have been posted in last 30 days. Elance is a community of over 3 million freelancers and over 1 million businesses active across 180+ countries. So it is quite easy to find some talented freelancers as well as to sharpen your talent and skills. The freelancing at Elance includes a wide range of projects like content writers and copywriters, web designers, graphic designers, application developers and testers, software engineers, translators and data analysts, market researchers and social media marketers, SEO experts, customer service agents, accountants, lawyers and business consultants etc. Guru is yet another such platform which is increasingly becoming more popular these days. Due to the ease at which you can search and filter out works from a wide range of about 100+ main job categories, Guru is one on the verge of becoming one of the leading job portal of world. As the stats on this website shows, about 2 million people have used Guru to complete more than 800,000 jobs so who knows, one of such jobs might be waiting for you ! Last but not least, Simply Hired is one of the most trusted and leading portal of India that let’s you hire or get hired ”simply”. 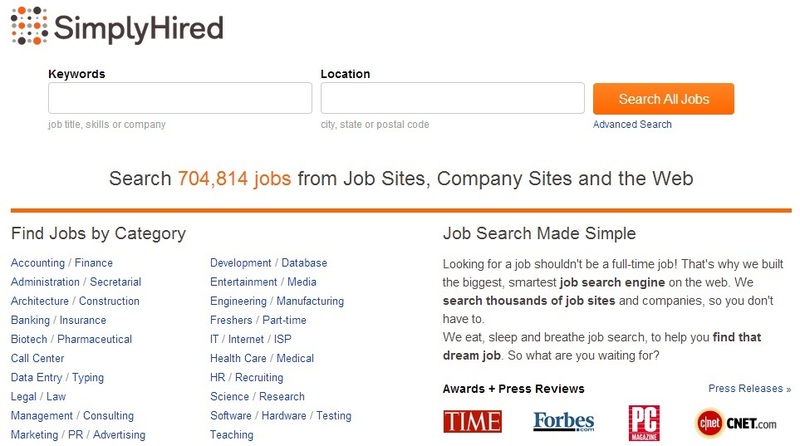 You can easily search jobs from a large number of about 704, 814+ jobs including the categories like accounting, banking, engineering, data entry, writing, software development, project management and business consultants etc. Searching the job on this portal and getting hired is simple just like its name. Simply Hired is increasingly becoming popular among Indians. The best thing about this portal is that – it has a unique feature of advanced search that does your work to find a job simple as you can easily filter tasks depending upon your requirements and location also. Freelancing is no doubt an excellent way to work online and get paid. However, getting a job these days is a tough job, but the presence of such portals makes it simple to communicate with a large mass of online community and bid yourself to get hired if you have some professional skills. Initially, you might find it difficult to get hired or find any job because there are many established freelancers already who is winning the competition of getting hired but if you have the desire to get hired, you’ll definitely be hired. So start now because if you don’t start early, you can’t get established early, and life is too short to live so make sure looking for a full-time job might not become your full-time job. Hope you enjoyed reading this article, these are my “Top 5 Places to Look for Freelance Jobs”, what are yours best ??? Do let me know your views; I would be highly pleased with your such remarkable efforts. Another good job board for freelance is XPlace. It has higher hourly rates than the majority of other online marketplaces, doesn’t charge a commission from freelancers, and there are a lot of job opportunities (entry-level and more complex ones). An excellent website to make a freelance career! Previous: iPhone 6 Full Specifications: What’s New and What’s Missing? Next: How to Find Royalty Free Blog Images Using Google Search?